Men of the 'Fighting 69th,' an Irish Brigade regiment. Monday was the 150th anniversary of the Battle of Antietam, the bloodiest day in American history. 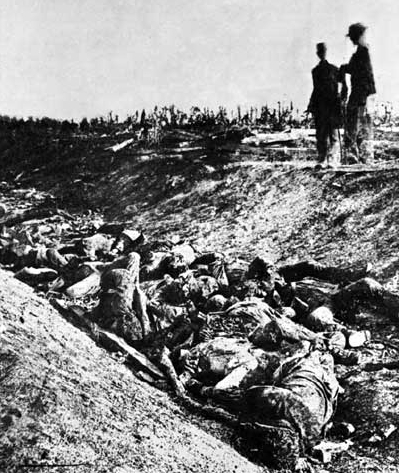 On September 17, 1862 the Union and Confederate armies met in a wicked, and ultimately, indecisive battle in western Maryland that left over 20,000 Americans dead or wounded. Given the large number of Irishmen who saw action in the American Civil War, that day must also rank up there as one of the bloodiest days for the Irish. General Francis Meagher's Irish Brigade, which included a portion, by no means all of the Irish who fought in the war, was in the thick of some of the deadliest fighting. 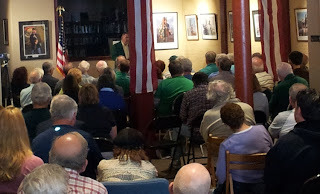 By chance I was in Albany, NY on Sunday and went to a lecture on the Irish Brigade in the American Civil War given by Siena College History Professor Tom Kelly (retired). 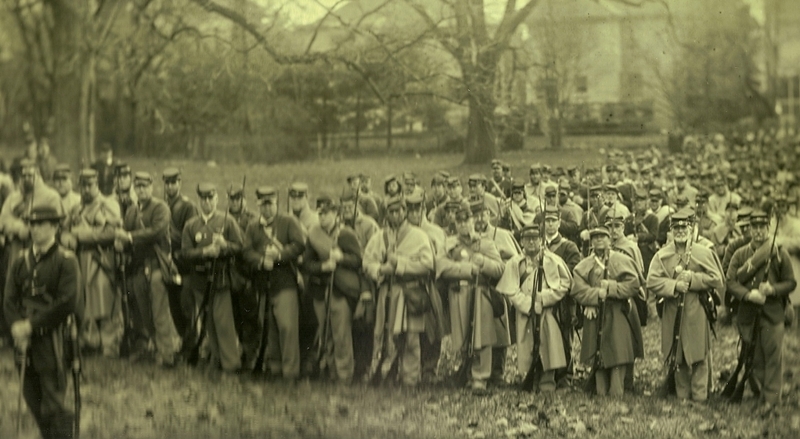 Professor Kelly's talk ranged over the entire war, but as he pointed out that the Irish Brigade really made its name at two battles: Antietam and Fredericksburg. 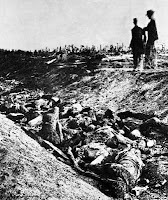 after the Battle of Antietam. Early in the war the Irish Brigade earned a reputation for valor and discipline in battle (and indiscipline and intemperance in camp.) Of course when a unit gets a 'good reputation' it is then often assigned to undertake the toughest jobs. That was the case for the Irish Brigade. At Antietam the Irish Brigade was tasked with attacking Confederate troops, who were massed in a natural trench, a 'sunken road' created by man and nature over hundreds of years. Both the Irish Brigade attackers and the Confederate defenders suffered terribly. When the battle was over the number of Confederate dead in the sunken road led to it being renamed as "Bloody Lane." The Irish Brigade's dead and wounded were also numerous and spread over a small bit of the large field immediately in front of the Bloody Lane. Half of the thousand men who went into battle that morning were dear or wounded by the day's end. Professor Kelly had all of our attention as he relayed these details. I was standing in the back from where I could see that the audience was intensely interested in what he had to say. I was late to arrive and like many couldn't get a seat for the talk. 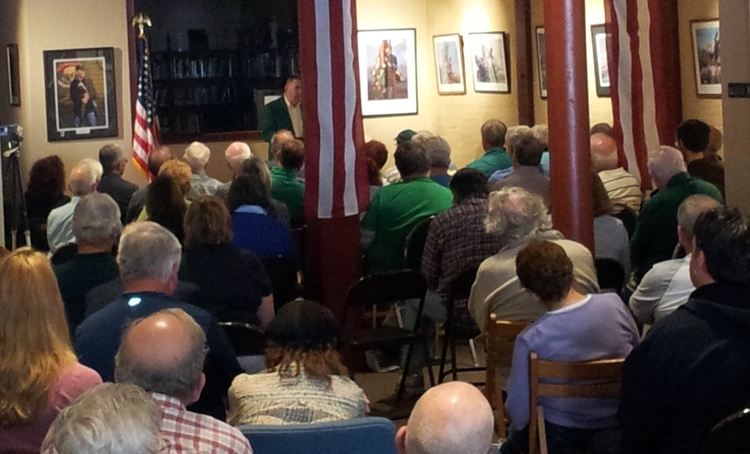 The event was in the Irish American Heritage Museum in downtown Albany and it attracted a lot more people than they were anticipating. Despite the size of the (admittedly mostly older) crowd, when one of the Museum's executives addressed us at the end he expressed a fear that interest in 'our Irish heritage' is waning, especially among the young. Like most who were there I was vaguely nodding my head in agreement. Yet later on when I was thinking about it I wondered how many of the grey-haired-heads in the audience were much interested in their Irish heritage when they were 20. I would bet they were more interested in Elvis or Marlon Brando or Marilyn Monroe or Mickey Mantle than in the history of the Irish in the Civil War. In fact, given the proliferation in Irish Studies programs at American colleges I suspect that interest in 'our Irish heritage' has probably never been greater among the young. What's important is that the stories of the old, the artifacts and details of history are not lost so that when today's young Irish Americans are older they can refer back and learn about the Irish experience in America. That's what makes organizations like the Irish American Heritage Museum in Albany and similar bodies across the country important. They're preserving those stories and artifacts. There is no need for pessimism. Interest in our Irish heritage is going to grow, not wane, thanks to the Irish Studies programs, but mostly thanks to all the new technology that makes preserving the stories, history and even the artifacts so much easier than it was in the past. The Irish experience at Antietam and millions of other stories will not be lost. They will all be on YouTube.